Please refer to our stock # 1778 when inquiring. 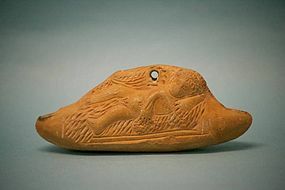 Hellenistic Terracotta Oil Lamp of a Putto, ca. 300-200 BCE. 4 1/2" in length. Unusually shaped double spouted oil lamp with recumbent cupid. Holding a wreath in one hand. Curled hair. Clearly defined eyes and nose. Not your common oil lamp.